My cat Twiggy had spay surgery 2 days ago. She eats and sleeps well. Seemingly she is recovering properly. My concern is the red part on the top of the wound. Has the stitches come loose partially, or is the redness caused by an infection? Do I have to take her to vet immediately? Thanks for your question. I'm sorry I could not answer it sooner than I did. This is a tough question to answer without actually seeing Twiggy. From looking at the photo, my answer could go either way. How is Twiggy acting? If she is paying no attention at all to her incision and if the redness and swelling is not getting worse then I think it is ok to watch this for a few days. -If she is licking at it more than a couple of times a day. -If there is any yellow fluid leaking out. -If you feel in your gut that something is wrong. If none of the above are happening then I would keep an eye on things. 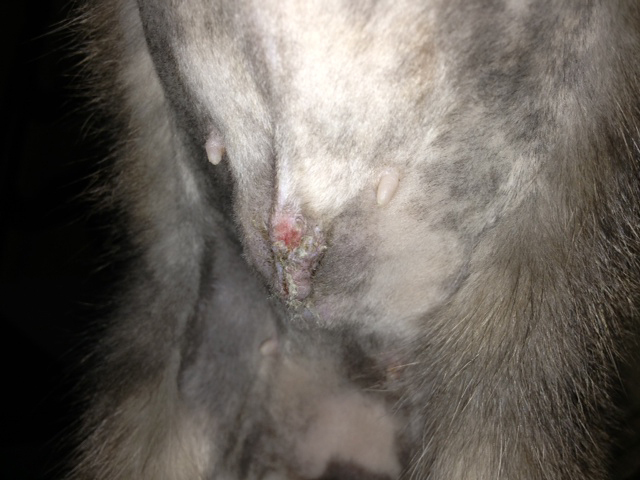 Sometimes cats can have significant swelling on their spay incision that goes down after a week or so.